The Knit Wits went on a Field Trip today! “Knit Wits? 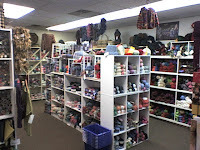 ?” We are a group of gals who love to knit and crochet and we normally meet on Thursday mornings at our terrific local book shop-Shakespeare and Co. Kernersville, sadly, does not have a yarn shop, though Ben Franklin offers a fair selection. So, every now and then, we go on a Field Trip to a specialty yarn shop in neighboring towns. 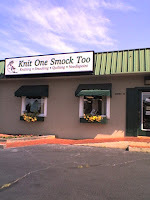 Today, we went to Knit One Smock Too in Winston-Salem. This shop is amazing as it not only has exquisite yarns for the crocheter and knitter, but also has everything you need for quilting, smocking, needlepoint, cross-stitch, etc! The talented ladies who run this shop are both knowledgeable and oh so friendly! I just love them…and I also have the good fortune to be able to teach there. So the four of us who went today were simply glowing with inspiration and ideas and some even with yarn for lovely projects or two. There’s nothing like a visit to a yarn shop to get the creative juices flowing!